In the education world, using data to drive instruction is crucial. 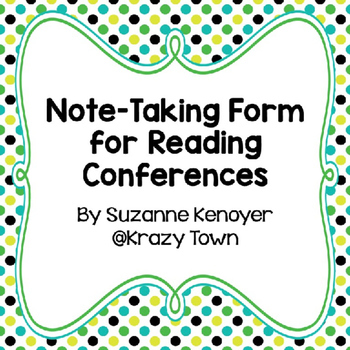 I tried many different ways to keep anecdotal data on my students when conferring in reading workshop. Eventually, I came to use this form. 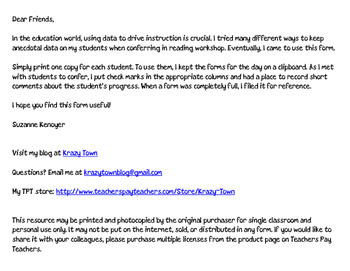 Simply print one copy for each student. To use them, I kept the forms for the day on a clipboard. As I met with students to confer, I put check marks in the appropriate columns and had a place to record short comments about the student’s progress. 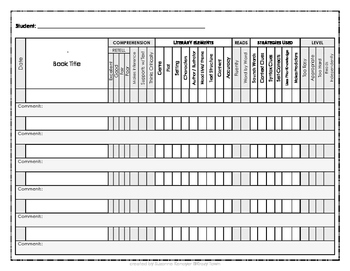 When a form was completely full, I filed it for reference. Copyright © Suzanne Kenoyer and Krazy Town. All rights reserved by author. This product is to be used by the original downloader only. Copying for more than one teacher, classroom, department, school, or school system is prohibited. This product may not be distributed or displayed digitally for public view. Failure to comply is a copyright infringement and a violation of the Digital Millennium Copyright Act (DMCA). Clipart and elements found in this PDF are copyrighted and cannot be extracted and used outside of this file without permission or license. Intended for classroom and personal use ONLY. 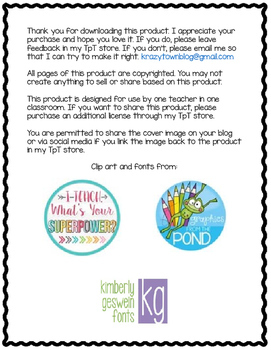 See product file for clip-art and font credits. Interested in Reading Workshop? Take a look at this. •	Look for the red star near the top of any page within my store and click it to become a follower. You will now receive customized email updates about this store.